"And you, Gallardo, remember the plaudits of the world are as fickle as a woman's whims." Rudolph Valentino was one of the most notable screen personalities of the 1920s. When he died young and under mysterious circumstances in 1926, he was mourned by immense crowds not rivaled until the assassination of John F. Kennedy. 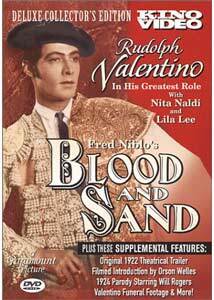 Kino here brings to DVD one of Valentino's most notable roles, as the bullfighter Juan Gallardo, in the adaptation of Vicente Blasco Ibanez' 1908 novel, Sangre y Arena. Young Juan has dreams of being a bullfighter, though they are belittled by his mother (Rose Rosanova) and mocked by his sister, Encarnacion (Rosita Marstina) and brother-in-law, Antonio (Leo White). But when Juan becomes a great success in the arena, they (especially Antonio) are happy to bathe in the reflected glory of the toreador. His career is paralleled in part by the life of a bandit, Plumito (Walter Long), since both of them make their livings by violence and bloodshed. When Juan marries his childhood sweetheart, Carmen (Lila Lee), all seems well. But then Juan meets the aristocratic widow Dona Sol (Nita Naldi), and strays from poor Carmen, leading to disaster on all sides. It's easy to see why Valentino was so adored. He has a radiant sensuality that drips off the screen, much as was the case with Marilyn Monroe. His air of confidence is readily visible. He takes the part and has a good deal of fun with it, occasionally going over the top. Though he doesn't have much chemistry with Lee, he does with Nita Naldi, in her usual vamp role. The sparks truly fly when these two are on the screen; unfortunately that's only the last third of the picture. One of the indelible moments of the silent cinema comes when Valentino has his arm around Naldi as he talks about going back to his wife; putting the vampire back into vamp, Naldi takes bite out of his hand! The pacing is fairly slow, and occasionally matters drag a bit. I for one became impatient until the Dona Sol subplot hit the screen. Although Blasco Ibanez' novel is an indictment of bullfighting, that aspect of the story almost becomes an afterthought here. It's as if director Fred Niblo (who would make Ben Hur in 1925) is rather entranced with the bull ring himself. He tends to emphasize the misogynistic aspects of the story far more than the condemnation of the toreros. Only the character of the philosopher Don Joselito (Charles Belcher), an odd background character who collects torture devices, does anything to criticize the arena. This helps the film keep from being a polemic, but at the same time the message is in danger of getting lost in the romantic adventures of Juan. Obviously not a program for PETA members, there is actual bullfight footage in the film. The stock footage of the bullfights does not mesh well at all with the shots of Valentino, giving the proceedings a highly fake appearance. The most effective part of the picture is the human drama, which comes across nicely in a multifaceted presentation. Image Transfer Review: There are issues with the picture, but they seem to be mostly traceable to the source print used. It shows heavy wear, with scratches, speckles, blotches, tears and other damage throughout the running time. Detail is lacking through most of the duration, which is odd considering the case states that it is taken from a 35mm negative. It looks more like a 16mm blowup to me. Black levels are good throughout, however, and once one gets acclimated to the damage it's watchable. The stock footage for the bullfight sequences is in terrible condition and looks very dupey. Audio Transfer Review: The 2.0 audio is provided by the Mont Alto Motion Picture Orchestra, and is arranged from a variety of Spanish-tinged tunes. It fits the atmosphere of the picture nicely. Being a new recording, the sound is essentially flawless. I heard no distortion, clipping, noise or hiss. There is significant surround material when processed through a Dolby Surround receiver. Extras Review: Kino once again provides an interesting array of extras. Notably missing is the Stan Laurel satire, Mud and Sand, however. Instead, Will Rogers gives his interpretation of the bullfight scene from the picture, with comic behind-the-scenes looks. A documentary of sorts is provided; this is an introduction to the film by Orson Welles from the TV series The Silent Years. Welles discusses his own bullfighting experiences, and includes a variety of scenes from rarely-seen early pictures from Valentino's career. Though not intended to be a full documentary, it nonetheless conveys more information than many studio making-of presentations today. About three minutes of footage of the vast crowds attending Valentino's funeral is included; they are quite impressive indeed. The original theatrical trailer makes an appearance, though it's in fairly poor condition. Almost nothing of the film is seen; it's sold almost entirely on Valentino's presence. A sheet-music tie-in was issued for the film, with the love theme You Gave Me Your Heart. This is a predictably insipid love tune with a bit of a tango inflection. Susan Hall of the Mont Alto sings the piece, and the viewer can follow along on the sheet music, which is an interesting method of presentation. A lengthy and pedantic 1922 essay by Isaac Goldberg on Blasco Ibanez and his novel is included as well. It's a bit tiresome and esoteric. More entertaining are a pair of period articles from Photoplay magazine. One is a predictably chauvinistic piece, reputedly by Valentino himself, on Women and Love. The other is a series of messages from Valentino from beyond the grave relating his experiences in the afterlife. The entertainment value is high, but not for the reason that the authors intended. Wrapping up the package is a rundown of the various pieces, chapter by chapter, that make up the score. Those interested in the music will find this useful for identifying particular pieces that seem familiar. Chaptering could be better; the last two chapters are quite lengthy indeed. Valentino's signature role, from unfortunately beat-up source material, with a good orchestral score and quite a few interesting extras. Worth a look.